This article is about the Clive Palmer project. For the 2010 disaster film, see Titanic II (film). For the Titanic replica ship under construction in Sichuan, see Titanic replica (Sichuan). Titanic II is a planned ocean liner intended to be a functional modern-day replica of the Olympic-class RMS Titanic. The new ship is planned to have a gross tonnage (GT) of 56,000 while the original ship measured about 46,000 gross register tons (GRT). [note 1] The project was announced by Australian millionaire Clive Palmer in April 2012 as the flagship of the proposed cruise company Blue Star Line Pty. Ltd. of Brisbane, Australia. The intended launch date was originally set in 2016, delayed to 2018, then 2022. As of October 2018[update], the development of the project was expected to resume in November 2018 after a hiatus which began in 2015, caused by a financial dispute that affected the $500 million project. The concept of a functioning replica of the Titanic has been explored several times, especially following the resurgence of interest following the release of James Cameron's film in 1997. The most widely publicized project was that of South African businessman Sarel Gous in 1998. The South African project began in 1998, and was one of the subjects of an article in Popular Mechanics magazine in September of that year. The article discussed the changes to the original design required to produce a safe and economically viable ship, including a welded rather than riveted hull, diesel-electric propulsion in place of steam engines, and a bulbous bow. The article concluded that although the various Titanic revival projects would cost $400–$600 million, they could be economically viable. In October 2012, Blue Star Line announced that Titanic expert Steve Hall had been appointed as Design Consultant and Historian for the project, and that Titanic interiors expert Daniel Klistorner had been appointed as Interior Design Consultant and Historian. Hall and Klistorner had previously co-authored books such as Titanic: The Ship Magnificent and Titanic in Photographs, and gave a technical presentation at the unveiling of the designs in New York, as well as at the dinner in London. Later that month, it was announced that an advisory board would be formed to provide "suggestions and recommendations to Blue Star Line to ensure the Titanic II appropriately and respectfully pays homage to Titanic, her crew and passengers." Terry Ismay, the great-great nephew of White Star Line chairman and Titanic survivor J. Bruce Ismay, will be a member of the board, as well as Helen Benziger, great-granddaughter of Titanic survivor Margaret "Molly" Brown. The design for the Titanic II was unveiled at worldwide launch events in Macau (China), New York (United States), Halifax (Canada), London & Southampton (United Kingdom). The gala event in New York was the official Global Launch and was held aboard the USS Intrepid in New York City on 26 February 2013. The gala dinner in London (UK) was held at the Natural History Museum on 2 March, and was accompanied by a display of items salvaged from the Titanic. There was also a breakfast held in Southampton on 13 March. On 16 April 2013 it was announced that Deltamarin had been contracted for the project development phase, and would be responsible for coordinating the various parties involved in the project, including the shipyard, architects, interior designers and operations managers. The feasibility study was complete, and the project development phase was ongoing. The signature of a contract and keel laying was expected in March 2014. Further contracts and agreements relating to the design and construction were announced later in 2013; the appointment of V.Ships Leisure as ship management services partner, and of Tillberg Design as provider of architectural and interior design services. On 17 July 2013, Blue Star Line announced that the classification society Lloyd's Register has joined the Titanic II project. The work carried by Lloyd's would ensure that the ship's design complied with the current SOLAS regulations. Model testing using a 9.3-metre (31 ft) wooden model was undertaken in September 2013 at the Hamburgische Schiffbau-Versuchsanstalt (HSVA). Resistance and powering tests were carried out in a 300-metre (980 ft) towing tank. In an interview in February 2014, Palmer claimed that keel laying would take place in September 2014. He cautioned that the project was "a big job", that the original Titanic took seven years to build while they have been working for only two and a half, and said that he would have liked to start sooner but "wanted to make sure we don't make any mistakes". He claimed that a selection of cabins were being constructed on land for approval, and that this would be completed by July 2014. In April 2016 the administrators for Palmer's closed nickel refining company, Queensland Nickel alleged that almost $A6 million had been taken from that company to pay for the development and marketing of the Titanic II. At that time the administrators indicated that they would seek to recover this money. Diesel-electric propulsion system with four diesel generating sets providing power for three azimuth thrusters to replace the original coal-fired boilers, steam engines and steam turbine, as well as the rudder. Also, the ship would have had 2 bow thrusters. An additional "safety deck" between C and D decks for lifeboats and marine evacuation systems, with the boat deck housing replicas of the original lifeboats. Space for the deck was made by lowering decks D and below by 2.8 metres, and for the taller centre section of the safety deck, which would have housed the lifeboats, by raising the superstructure by 1.3 metres. In spite of the reduced draft, space was made for the lowered decks by removing the orlop deck, which mainly housed the boilers. New 'escape staircases' in addition to the original staircases, housed in the redundant boiler exhaust uptakes. No sheer or camber, unlike the original. Pronounced sheer was a cosmetic feature of ocean liners, intended to add a graceful appearance to the ship, but made construction more difficult and therefore costly. Renderings released in February 2013 showed an upwards rake added to C Deck at the bow and stern to give a superficial appearance of sheer, although an inauthentic wedge-shaped gap has had to be added between C and D decks in these areas to produce this effect. A higher bridge relative to the bow, as the superstructure has been raised by 1.3 metres by the centre section of the safety deck, and also by the removal of the sheer. This negates the requirement on the original Titanic for lookouts. For economic reasons, the steam engines and coal-fired boilers of the original Titanic were replaced with a modern diesel-electric propulsion system. The space which housed the boilers would have been used for crew quarters and ships systems. Power was to be produced by four Wärtsilä 46F medium-speed four-stroke diesel generating sets; two twelve-cylinder 12V46F engines producing 14,400 kilowatts (19,300 hp) each, and two eight-cylinder 8L46F engines producing 9,600 kilowatts (12,900 hp) each, running on heavy fuel oil and marine gas oil. Propulsion would have been by three azimuth thrusters which would also be used for manoeuvring, while the replica of the rudder of the Titanic II is purely cosmetic, and would not have extended substantially below the waterline. The positioning of the azimuth thrusters necessitated the stern being made substantially more blunt than the original. 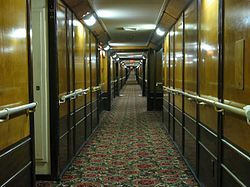 The interior of the ship was intended to be as similar as possible to the original. Tillberg Design of Sweden was contracted to produce drawings replicating Titanic's original interiors. However, the original wooden panelling does not conform to modern fire regulations, so as in Queen Mary 2, veneers would have had to be used. Plans showed a layout broadly similar to the original, but with the third-class cabins modernised, and consideration being given to en-suite cabins throughout the ship. [needs update] The room freed up by eliminating the steam boilers of the original ship would have been used for crew quarters and various services. 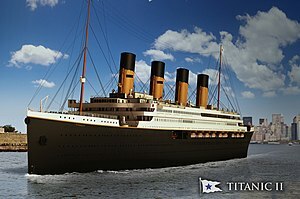 The Titanic II would represent the first major passenger vessel constructed in China, a country with much more experience of building cargo ships than cruise ships, and a significant investment would be required to ensure it met the much more stringent safety requirements for passenger vessels. The Chinese state-owned CSC Jinling shipyard has never built a large passenger vessel. In addition, it has no drydock, instead using side launching from a 200 m slipway. The 269 m Titanic II would have been the largest side-launched vessel in history by a huge margin, and would have required a significant extension to the shipyard's facilities. Representatives from the shipyard had questioned whether the ship could have been completed by 2016, and emphasized that no contract had been signed. Clive Palmer has been described as an "eccentric billionaire" with a reputation for bizarre publicity stunts, such as the attempt to create a massive Jurassic Park style dinosaur theme park at his golf resort. It has also been noted that the publicity surrounding the Titanic II coincided with Palmer's announcement of his entry into Australian federal politics, which was made immediately following the Titanic II conference. Palmer had previously claimed that he was the target of a conspiracy involving Barack Obama, the CIA, the Rockefeller Foundation and Greenpeace, who he believed were attempting to close down his mining operation. In 2010, Palmer started a company called Zeppelin International, with the intention of making a commercially viable Zeppelin. After the plan came to nothing, it was ridiculed as the 'bizarre move of the year' by Australian business website Smartcompany. He has gained a reputation in Australia for floating ambitious and unusual business ideas which he fails to see through, and the Titanic II has been described as "a classic Clive Palmer announcement." The idea of a commercialised replica of the Titanic has itself been criticised, being described as "insensitive" and "a mockery of the memory of those who died". Cunard Line, which acquired the White Star Line legacy when the companies merged, stated that they "have always been very mindful and very respectful of such a tragic event [and] don't think that building a replica or a 'II' is appropriate." 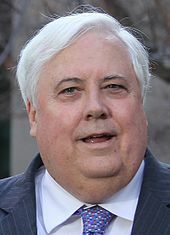 Palmer's alleged use of funds drawn from Queensland Nickel for the Titanic II project was criticised by the administrators appointed for that company after it closed. In their April 2016 report, the administrators stated that payments from Queensland Nickel to Blue Star Line had been "uncommercial and director-related transactions". Palmer has rejected the claims made against him in the report, including those related to the Titanic II. When the project was first announced in 2012, Palmer claimed that construction would begin before the end of the year, with a 2016 launch. The following year reports emerged that Clive Palmer was experiencing financial difficulties. The start of construction was postponed to March 2014, then to late 2014. When construction had still not begun in 2015 a spokesman for Palmer said the project had merely been delayed, and that the new ship would be launched in 2018 - two years later than initially planned. However Deltamarin had told an Australian Broadcasting Corporation journalist that work on the Titanic II project had been halted while workers at the Chinese shipyard identified as the likely site of construction were highly skeptical that the project would ever move beyond the proposal stage and the Blue Star Line trademark was "abandoned." Queensland Nickel went bankrupt and Palmer faced freezing of personal assets to recoup money owed the company's employees and creditors. When he declined to stand for re-election to his House of Representatives seat he stated that he might resume work on the project in his retirement. In May 2018 a European maritime equipment consortium published a list of all cruise ships on order through 2027 but none of the listed vessels fit Deltamarin's specificatons for Titanic II. On September 27, 2018 the Blue Star Line, in a press release on their official web site, announced that work on the project would recommence. Prior to this, the media release web site had not been updated since May 2014. A press release on 9 November stated that work on the ship by Deltamarin was underway at that time; this company was to liaise with all contractors who are involved in the project. Palmer's project should not be confused with a Chinese Titanic replica ship which had its keel laying on November 29, 2016. Commissioned by Seven Star Energy Investment, it is to function as a part of Romandisea resort on the River Qi in Sichuan province. Unlike Palmer's Titanic II, the all-Chinese replica is not intended to sail on any ocean but will be permanently docked within a reservoir. The ship, which was still under construction in mid February 2019 was scheduled to be completed later in the year, although the initial completion date was 2018. The estimated cost of the project was £125 million. ^ a b The original Titanic had a gross register tonnage of 46,328 GRT, which is not directly comparable with modern gross tonnage. However, as one register ton is equal to 100 cubic feet (2.83 m3), an approximate value of 39,640 GT can be calculated by using the formulae given in The International Convention on Tonnage Measurement of Ships, 1969. ^ a b Cruise Ship Orderbook. Cruise Industry News. Retrieved 2013-04-23. ^ "Updated Titanic II model tests". Deltamarin Blog. 2013-09-20. Archived from the original on 2013-11-11. Retrieved 2013-11-11. ^ The Titanic sails again: Australian tycoon unveils plans for perfect replica of doomed vessel (except with a few more lifeboats). Daily Mail, 25 February 2013. Retrieved 2013-05-11. ^ Calligeros, Marissa (30 April 2012). "Clive Palmer plans to build Titanic II". Sydney Morning Herald. ^ Fickling, David (30 April 2012). "Titanic II to Be Built by Billionaire Palmer, Chinese Yard". Bloomberg. ^ "Titanic II set to sail in 2018, says Aussie billionaire - BelfastTelegraph.co.uk". BelfastTelegraph.co.uk. Retrieved 2017-03-25. ^ "Titanic II replica ship's cruise from Dubai delayed until 2022". Logistics Middle East. Retrieved 17 October 2018. ^ "Deltamarin continues work on Titanic II". The Guardian. Retrieved December 15, 2018. ^ "Deltamarin continues to work on Titanic II". Blue Star Line. 9 November 2018. Retrieved December 15, 2018. ^ Shabina (13 February 2019). "Titanic II Ship Ticket Prices 2022, Release Date, Construction Cost, Facts and Latest Updates". Traveljee. ^ Ringshaw, Grant (19 November 2000). "A Titanic task". Daily Telegraph. Retrieved 24 August 2012. ^ Wilson, James (September 1998). Titanic Reborn. Popular Mechanics. pp. 56–59. Retrieved 24 August 2012. ^ "Tycoon presents Titanic II proposal". BBC News. 9 June 2000. Retrieved 23 August 2012. ^ Ringshaw, Grant (19 November 2000). "A Titanic task". London: Daily Telegraph. Retrieved 11 October 2012. ^ Oldham, Jeanette (20 November 2000). "Dreams afloat to build Titanic II". Questia Online Library. Retrieved 11 October 2012. ^ a b Louis, Epstein. "To Build a New Titanic?". Archived from the original on 17 August 2012. Retrieved 11 October 2012. ^ "Clive Palmer Launches Titanic II". Blue Star Line. 30 April 2012. Archived from the original on 12 March 2013. ^ "MOU CSC Jinling and Blue Star Line". Blue Star Line. 20 April 2012. Archived from the original on 21 July 2012. ^ Jabour, Bridie (19 June 2012). "Titanic II a step closer to reality". Brisbane Times. ^ "Global Ship Design Firm Commissioned to Titanic II Project". Blue Star Line. 19 June 2012. Archived from the original on 9 March 2013. ^ "First Glimpse At Titanic II Plans". Blue Star Line. 19 June 2012. Archived from the original on 20 July 2012. ^ "Renown Titanic Historian Joins Titanic II Project". Blue Star Line. 1 October 2012. ^ a b "Titanic Researcher and Interiors Expert Joins Blue Star Line". Blue Star Line. 11 October 2012. Archived from the original on 24 October 2012. ^ "White Star Line Chairman Descendant Joins Titanic II Project". Blue Star Line. 19 October 2012. ^ "Molly Brown Descendant Joins Titanic II Project". Blue Star Line. 21 October 2012. ^ "New Dates for Titanic II Global Launch and Events". Blue Star Line. 20 December 2012. ^ "Design for Titanic II to be unveiled in NYC". MYFOXNY.COM. 3 October 2012. Archived from the original on 6 October 2012. ^ "London Event To Celebrate Titanic II Project". Blue Star Line. 9 October 2012. ^ Crook, Andrew. "Deltamarin to manage Titanic II project development". Blue Star Line - Delta Marin Group via setcorp.ru. Retrieved 26 July 2015. ^ "Titanic II tycoon Clive Palmer plans movie cameo". London: Daily Telegraph. 22 October 2013. Retrieved 23 October 2013. ^ "V.SHIPS Leisure Appointed To Titanic II". Blue Star Line. Retrieved 29 May 2013. ^ "Titanic II Engages World's Leading Marine Architecture and Interior Design Company". Blue Star Line. Retrieved 29 May 2013. ^ "Titanic II (May 29, 2013)". Tillberg Design of Sweden. Archived from the original on 9 December 2013. Retrieved 4 June 2018. ^ "Lloyd's Register Joins Titanic II Project". Blue Star Line. Archived from the original on 2013-07-23. Retrieved 20 July 2013. ^ Goodman, Ted (January 3, 2017). "Daily Caller News Foundation Titanic Recreations Prepare To Set Sail". Daily Caller News Foundation. Retrieved 2 February 2017. ^ "Clive Palmer announces Titanic II model tests to be held in Germany". Robert's Cruise & Tour Leading E.U. Retrieved 14 August 2013. ^ "Titanic II: Replica of proposed liner tested". British Broadcasting Corporation. 19 September 2013. Retrieved 20 September 2013. ^ Grattan, Michelle. "Politics with Michelle Grattan: Clive Palmer". Retrieved 7 March 2014. ^ a b Koziol, Michael (13 April 2016). "Queensland Nickel 'paid $6 million' towards Clive Palmer's stalled Titanic II project". The Canberra Times. Retrieved 23 August 2016. ^ "Get a Glimpse of Titanic II". Cruise News. 25 July 2012. ^ Vandersteel, William. "SS Oceanic; A Matter of Design". ssmaritime.com. Retrieved 26 August 2012. ^ "The Return of a Legend". Blue Star Line. Retrieved 16 February 2013. ^ "Titanic II: Return Of The Legend". Blue Star Line. Retrieved 26 April 2013. ^ a b Yi, Zheng. "Titanic II agreed but no contract signed". Global Times. Archived from the original on 7 April 2013. Retrieved 17 February 2013. ^ "Our Partners". Blue Star Line. Archived from the original on 2012-08-11. Retrieved 17 February 2013. ^ Khetan, Ashok. "World's Biggest Side Launch of Ship in Gujarat". Archived from the original on 2013-10-18. Retrieved 17 February 2013. ^ Alwyn-Jones, John. "Clive Palmer goes even more eccentric". E-Global Travel Media. Archived from the original on 2012-11-03. Retrieved 17 February 2013. ^ "The Titanic, a dinosaur, JFK and the Australian PGA Championship". aussiegolfer.net. Archived from the original on 2012-12-14. Retrieved 17 February 2013. ^ "Is an Australian billionaire about to launch the real-life Jurassic Park?". London: Daily Mail. 2 August 2012. Retrieved 17 February 2013. ^ McKechnie, Kirrin. "Clive Palmer's Titanic bid for federal politics". ABC News. Retrieved 17 February 2013. ^ Farr, Malcolm (22 March 2012). "Mining magnate Clive Palmer says CIA is behind campaign to kill coal industry". News.com.au. Retrieved 17 February 2013. ^ Cowie, Tom. "Clive Palmer's magnificent flying machines". Crikey.com.au. Retrieved 17 February 2013. ^ Thomson, James. "The best & the worst of 2010". Smartcompany. Archived from the original on 2012-04-10. Retrieved 17 February 2013. ^ Thomson, James. "How Clive Palmer funds his amazing adventures". Smartcompany. Retrieved 17 February 2013. ^ Gaynor, Hazel. "Sinking feeling: unease about Titanic II plan". Irish Examiner. Retrieved 26 April 2013. ^ Patrick, Neil (May 28, 2016). "Titanic II- Bigger replica of the iconic liner, to set sail in 2018 …". VingateNews.com. Timera Media. Retrieved 2 January 2019. ^ Remeikis, Amy; Danckert, Sarah (13 April 2016). "Queensland Nickel report 'filled with innuendo': Clive Palmer". Brisbane Times. Retrieved 13 April 2016. ^ Khadem, Nassim. "Clive Palmer disputes 'beat-up' about Queensland Nickel's future". BRW. Retrieved 30 May 2018. ^ Mccullough, James (22 May 2013). "Clive Palmer still Queensland's richest person". news.com.au. Retrieved 30 May 2018. ^ "Australian tycoon says Titanic project is about love". The Malay Mail. Retrieved 30 May 2018. ^ "Deltamarin designs Titanic II". Deltamarin. Retrieved 30 May 2018. ^ "Titanic 2 ticket demand renewed following latest launch news". CruiseNews, Dansway Communications LTD. Archived from the original on 2017-07-03. Retrieved 30 May 2018. ^ McCutcheon, Peter (27 March 2015). "Clive Palmer's empire feeling the pinch from falling iron ore prices". ABC News. Retrieved 30 May 2018. ^ "Palmer's Titanic II plans all but scuttled". 9News.com Finance. 20 March 2015. Retrieved 30 May 2018. ^ "Trademark Category > Chemical Products > TITANIC II BLUE STAR LINE". LegalForce Trademarks. Trademarkia, Inc. Retrieved 30 May 2018. ^ Branco, Brace (April 22, 2016). "Queensland Nickel liquidators could freeze Clive Palmer's assets". The Sydney Morning Herald. Retrieved 30 May 2018. ^ Jeans, David (May 7, 2016). "Is mining billionaire Clive Palmer's Titanic II dream under water? Finnish shipbuilder 'has stopped working on plans' to design a replica of the doomed ocean liner". The Daily Mail. Retrieved 30 May 2018. ^ "AMEM Cruise Ships on Order 2016-2027". Austrian Marine Equipment Manufacturers. Retrieved 30 May 2018. ^ "Palmer Building Titanic II" (Press release). Blue Star Line. September 27, 2018. Retrieved 17 October 2018. ^ "Global ship design firm Deltamarin onboard for Titanic II". Blue Star Line. 5 November 2018. Retrieved December 15, 2018. ^ Burford, Rachel (November 30, 2016). "Work begins on £116million life-size replica of the TITANIC in China which will allow visitors to relive the sinking which claimed 1,500 lives". Daily Mail. London, UK. Retrieved 5 December 2016. ^ Titanic, Romandisea (5 July 2017). "Our Titanic 2 project is due to be finished e arly 2019. Watch this space!". @RomandiseaT2. Retrieved 2017-10-15. ^ "China is building a full-size replica of the Titanic". CNN Travel. 2016-12-01. Retrieved 2017-10-15. ^ "TITANIC II: China builds £125m FULL-SIZE Titanic replica - pictures". Express. 2019-02-16. Retrieved 2019-02-16.